As most of you know, I just graduated from Culinary school! Hence the repost, and less posts. Forgive me, I’ll be back to normal soon. But I am giving myself time to re coop, hibernate, hike, relax, and take a moment to soak it all in. I’ll share it all with you soon enough. 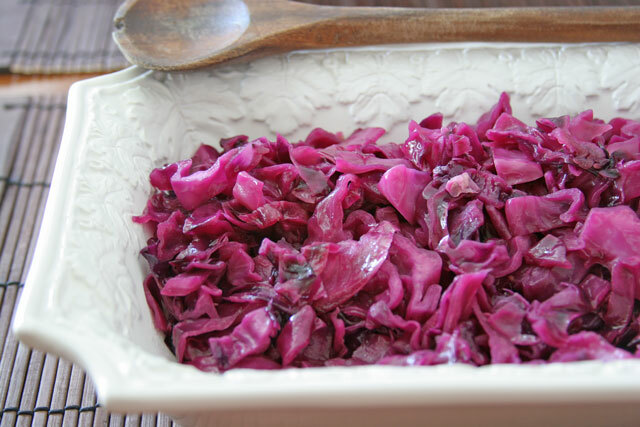 Till then, here is a favorite cabbage recipe of mine, it is so easy and tasty. Enjoy! Earlier this year, in January, to be exact, Brian’s brother took us to a German restaurant in our area. I like German food, I like all food, let’s be real. We tried all sorts of delicious Brats, veggies, and shared so we could try a little of everything. Sometimes that is the way to go. When the brats and cabbage arrived, I saw this gorgeous purple color, and went for it straight off. I could not get enough, I ate almost all of it, the boys liked it, but I LOVED it. So naturally I ate it all. Of course, I am sitting there saying, “I can totally make this at home, duh.” That is exactly what I did that week in January, and pretty much ever since. I am just now sharing it with you, and there is a good reason for it. When I make this, it is a quick kind of a thing. And I eat it all before I get to the photo, so I apologize for hoarding the cabbage recipe this long. Here it is, make it, eat it, love it. Plus it is super simple, and flavorful. 1. In a dutch oven or large pot, melt the butter over medium low heat. Add the cabbage, vinegar, and sugar, 1/2 tsp salt, and a pinch fresh ground black pepper. Stir to combine. Allow the cabbage to wilt a little, stir. Cover pot and cook for 30 minutes. Stir occasionally. 2. Remove lid after 30 minutes, and allow the liquid to reduce by 1/2. About 15 minutes. Taste. How is the seasoning? Need more salt or pepper, add a small pinch of each until it’s perfect! Hi! Thank you so much for the info. I’ll check it all out. There are nights when I make an entire meal out of sweet and sour cabbage… so I guess you could say I’m a fan of it 🙂 This looks like an awesome take on a traditional favorite. Can’t wait to try it! I seriously could this entire serving. That’s why I jokingly put serving size, me or 8. It is truly addicting! Actually not at all:). It’s a very simple flavor. Subtly sweet from the sugar with a butteriness, and a tang from the vinegar. Since it only cooks for less than an hour, there is not too much acidity from the vinegar like you would get from a saur kraut, or pickled product. You should try it. Maybe do a half batch in case you don’t like it.